I love me a good cuppa coffee. I used an Aeropress to make my morning coffee for years, but eventually came to like good drip coffee. I picked up a Bonavita BV1800SS automatic drip coffee maker. The Bonavita’s 1400W heating element heats the water up to the best temperature for drip, as I understand it. The hot water drizzles onto the ground coffee via a shower-head pattern, so all the coffee goodness in the cone gets used. 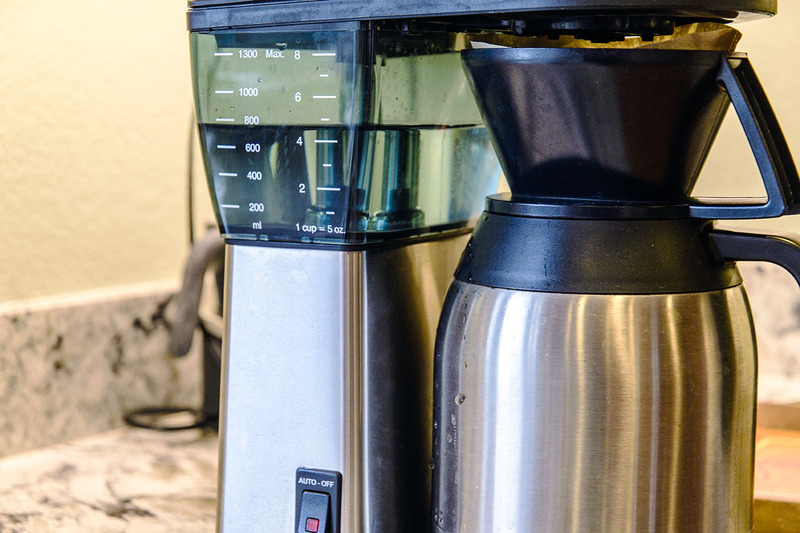 I grind my own beans, using a Baratza Encore, grinding 50g of coffee for a five-cup pot, with the grind setting at around 17-18 for the grind. It’s all a relatively affordable coffee-making kit. My preference for coffee comes from Peet’s, usually Pacific island varietals such as Sumatra or New Guinea. If you’re not familiar with Peet’s, the the company roasts their coffee quite dark, so the beans are covered with a lovely smelling, sticky oil. However, the result is very strong coffee. I’m not talking about the flavor, though Peet’s is something of an acquired taste, like a good, peaty Scotch. A typical cup of Peet’s coffee will give you a substantial caffeine jolt. 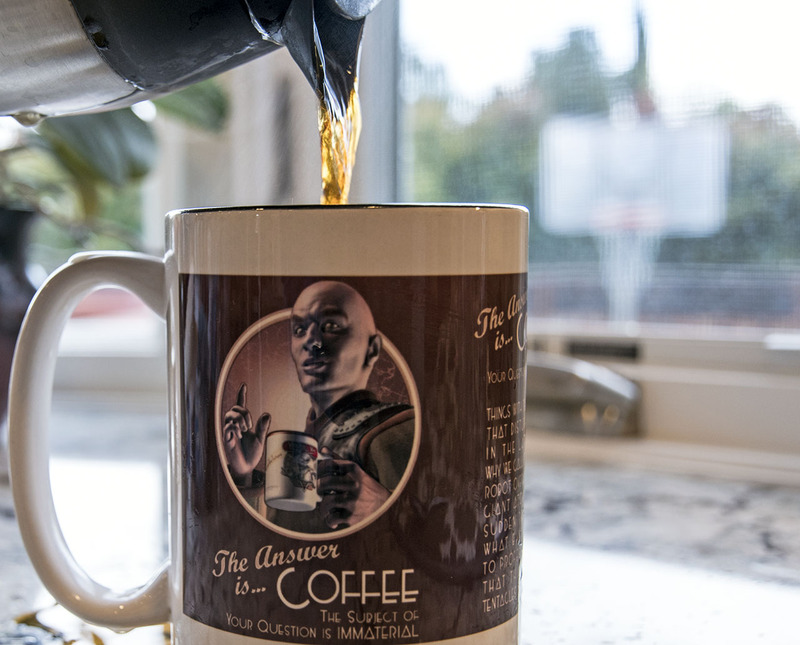 And since my daily cup of coffee comes in a 15-ounce cup, I was getting a pretty good dose every morning. And while I love my coffee, I thought it might be time to start backing off the caffeine. I found myself making frequent trips to the bathroom until after lunch due to the diuretic effects of so much caffeine. It became time to back off a bit. I started on a gradual caffeine reduction program, with an eventual goal of using 50% decaffeinated beans and 50% standard. The good news takes the shape of Peet’s decaf Sumatra, which blends in well with almost any of Peet’s coffees. Peet’s uses the Swiss water method for removing caffeine, so still retains some tiny amount of residual caffeine, but it’s pretty negligible. I began by adding one gram of decaf and 49 grams of standard coffee. Over three months, I gradually decreased the amount of caffeinated beans and upped the weight of the decaf. Now I’m at my magical 50/50 mix. This has done wonders for both my urinary tract, and the usual intense headaches which are the cost of caffeine reduction were noticeably absent. So if you’re a coffee addict, you might try the gradual method of toning down your caffeine intake. My goal of cutting caffeine intake by half worked pretty well, but this would likely work for anyone wanting to completely kick the habit. All it takes is a little patience.